Great cabins in the heart of Ephraim! We met with Kay Wilson, and took a tour of some the 4 cabins. We took a look at one of the 4 available cabins (two 1 BRs, one 2 BR, and one 3 BR): the Eagle. 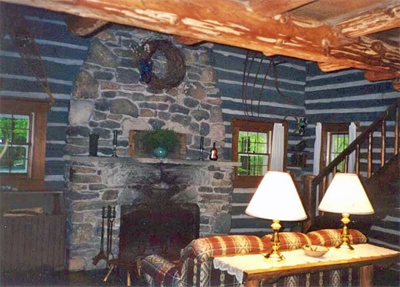 Part of the Pioneer Acres Cottages offered, the Eagle has a very rustic look and feel to it, from the wooden snowshoes and antlers on the whole-log walls, to the fieldstone fireplace. In the living room area on the first floor, is a couch in front of the fireplace, and another against a back wall, some chairs and a half-log stairway leading up to the bedrooms. The dining room downstairs is small but cozy, with a rustic table and chairs, a stucco fireplace/hearth, and other accessories. The kitchen is very small, and basic, but has what you need to do some in-cabin cooking. The bathroom, off the dining room, is also small and rustic. Upstairs, three bedrooms await you, as well as a loft overlooking the living room. 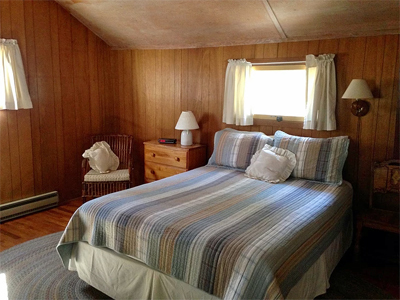 One bedroom has twin beds, a white dresser and mirror, vaulted ceiling; another bedroom has 2 twin beds also, and similar furnishings; the last bedroom has a double bed, a vaulted log ceiling, log dresser, and wood floor. 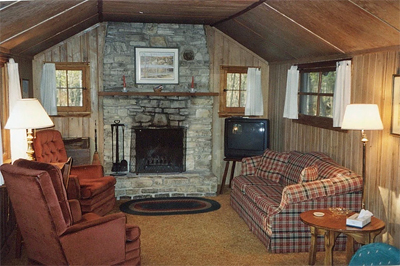 Overall, a very nice cabin for about 6 people. 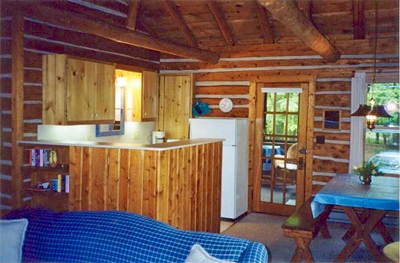 Three other cabins are available too. 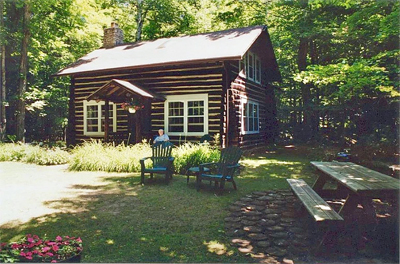 A very nice log cabin with tw0-bedrooms (one with a queen,m one with two twins), full equipped kitchen, and a dining area. The living room is graced with a fireplace, a vaulted ceiling, and a hide-a-bed for an extra guest. Fully carpetedm air conditioned. A nice option for about 5 people. A smaller cottage, at about 675 s.f. including the creened-in porch, is a one bedroom (with a queen bed), a galley kitchen (big emnough), screened-in porch which we like, and a full bath. Living room also has a hide-a-bed for an additional guest. Air conditioned of course. Nice smaller option. Same size as The Wren at 675 s.f. Phoebe is a one bedroom, with a queen, full bath, galley kitchen and dining area, air conditioned. Living room also has a hide-a-bed for extra guest..
You can check the dailey or weekly rates of all the cottages by clicking here. We think the rates are very reasonable, from about $118 a night to $2250 per night depending on the size and cottage, and the time of year you are going. Open from May 1 through about 3rd or 4th week in October. With all Pioneer Acres has to offer, we recommend you checking it out. Between the view, the location (short commute the town) and the nice cottages themselves, we think you will find Pioneeer Acres Cottages a very nice place to stay, in a most charming town. And please tell the folks at Pioneer Acres Cottages that DoorCountyNavigator.com sent you, and mention the property ID number!